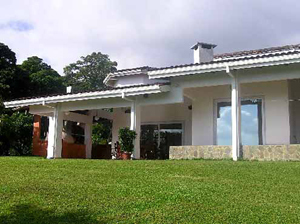 Here is an outstanding 75-acre finca with wonderful natural beauty and thoughtful, high-quality development by its European owner. 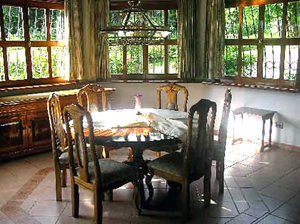 The finca has been transformed into an estate with three homes, a tennis court, and several other buildings. Using the natural springs and streams, ponds and waterfalls have been added to the great variety of pleasureable attributes, which include miles of lake and volcano vistas. Photos on this and the following page will show the various buildings. In addition, the homes are fully furnished, there is a 29-foot inboard/outboard cabin cruiser, a large tractor with enclosed cab, a BMW 4x4, horses and cattle, and a wealth of tools including welding, drilling, and cutting tools. The estate rises 550 feet from its footing on the lake highway, where there is an automatic gate and intercom system, which also connects the houses. Possible development of this finca, according to the owner, could include 30 lots and a 40-room hotel. 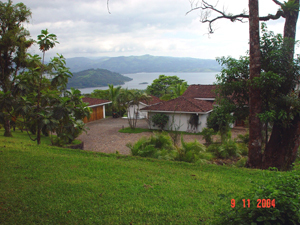 The purchase price for the whole 75-acre finca is $3,800,000. With a down payment of $1,000,000, the owner offers financing of the remainiing $2,800,000. Also, a buyer may select only the major portion of the property, the 55-acre portion that includes the homes and other developed features, which is offered at $3,200,000. On other websites the price of the whole 75 acres is given as $3,200,000 or $3,500,000. They are in error, according to the owner. A liquor license is also available. 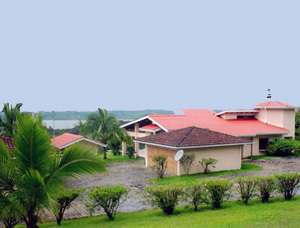 The finca is located at 10+ 33.837N and 84+ 55.968W. The main home has 2,202 square feet of interior space. In addition, covered verandas add 1,255 square feet for a total of 3,347 square feet under roof. The home is to be sold fully furnished. The home is air-conditioned with the equipment actually housed in a separate small building. There are two phone lines and satellite TV and Internet. All electrical, telephone, and intercom lines are underground. 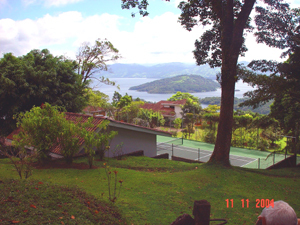 These views, which include Santa Elena Island, show that there is a large parking area at the main house and a tennis court between the main house and the primary guest house above. 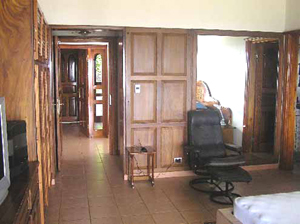 These views show some of the excellent woodwork and furnishings in the home. 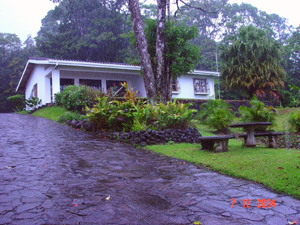 A paved interior road reaches, at left, the primary guest house above the main house and, at right, the second guest house near the fina entrance. 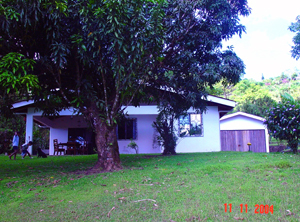 The first guest house has 3 bedrooms and 2 bathrooms in 1,200 square feet. The second has 1,000 square feet. Click here to view other buildings and features.